A judge granted Naheed Nenshi&apos;s request to allow a jury to hear a defamation lawsuit launched by a home builder against the mayor in a Calgary courtroom today. Cal Wenzel is suing Nenshi for comments he made during the 2013 municipal election campaign on CBC Radio that insinuated the Shane Homes founder previously broke election laws and runs a mafia-like organization. "We had a scene right outside of — out of the movie Godfather. 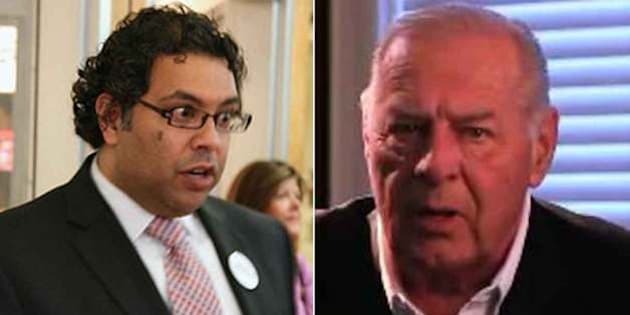 We had a guy admitting that he broke the law in 2010 in favour of one candidate," Nenshi told Calgary Eyeopener host David Gray in 2013. "Sorry, did you just call Cal Wenzel the Godfather?" Gray said. Wenzel says the remarks were untrue and damaged his reputation. He is seeking $6 million in damages. Nenshi says politicians should be free to speak on public issues without the fear of being sued. Negotiations by lawyers for both sides failed to resolve the lawsuit and it appears to be heading towards a trial. The mayor said he is paying his own legal bills on the matter.